If your teeth are crooked but you haven’t felt like traditional braces are an option for you because of how long they take, or how they look, do not despair. Now, using modern dental technology there are non-traditional braces options for people looking to straighten and beautify their smiles. At Mirelez Wellness Dental in Fresno, we offer ClearCorrect invisible braces as a clear and simple method to help our patients have the straight teeth they desire. ClearCorrect invisible braces use special clear aligners that stealthily straighten teeth without the braces and wires required by traditional braces. ClearCorrect have a number of fantastic benefits when it comes to helping patients in Clovis and Madera have the straight teeth of their dreams. Visibility/Appearance | Unlike traditional braces, ClearCorrect uses clear aligner trays to help our patients get straight teeth. Because the aligner trays are clear, they are practically invisible so those around you don’t even have to know that you’re straightening your teeth. 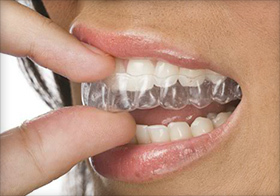 Convenience | ClearCorrect invisible braces uses removable, clear aligner trays. This means that when you need to take them out, you can. It also means that you can continue to take care of your teeth normally, and continue to eat the wonderful foods you love. Effectiveness | ClearCorrect aligner trays work faster than traditional braces, meaning that you can effectively straighten your teeth faster. Comfort | Each set of aligner trays are designed with the patient who ordered them in mind. This means that they are made to fit your mouth and your teeth comfortably, and makes it so the aligner trays work better. Dr. Mirelez and his team in Fresno feel that you deserve a smile that you can be proud of, and if you want to have straighter teeth without traditional braces then ClearCorrect is wonderful option to get that smile. Have any questions about ClearCorrect, or our other orthodontic options, Inman Aligners or Six Month Smiles? Contact us today if you are in Clovis or Madera!